The highest German spa town offers sports facilities, a museum, supermarkets and shops, a lookout tower, a craft workshop, and other attractions and activities. The foundation of Oberwiesenthal dates back to year 1527. Oberwiesenthal was established for the same purpose as other villages in the Ore Mountains - for the purpose of silver mining. Originally a mining town, it became a major tourist centre during the 19th century. People came and are still coming here for winter sports and spa treatment. You will reach Oberwiesenthal after a 4 km drive from Boží Dar. You can also get there easily by walking or cycling along some of the hiking trails. You will also find the nearest grocery shops, clothes shops, etc. There are also supermarkets Penny and Edeka. There's also Schlecker drugstore, NKD clothes shop, etc. Oberwiesenthal offers a wide range of services for visitors of every age in every season. There are also a few shops with traditional wooden carved products, in one carving workshop you can even peek into the production. In the next one, you can create your own candle after paying a small fee. If you need anything, the local tourist office will be happy to help and answer your questions. Residents of Boží Dar and Oberwiesenthal organise a sporting event called "Nordic walking without borders". 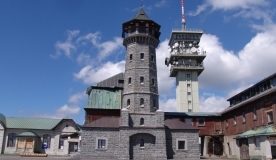 For more information, visit the website of the town of Oberwiesenthal.